Viewing topic "Plug-In Boards Compatibility Options"
Alright, I know that the Motif XS & XF - series does not have any slots for the PLG-series of expansion boards. My question is, is there any way to use the boards, like an external reader, or software to load the voices, which I then could transfer to my XF? Interesting question. My immediate thought says not; that you need a Motif ‘host’ in order to utilize them. But maybe someone has come up with a creative solution? The only thing you can do is buy an older Yamaha instrument that accepts PLG cards and control that from the XF. OK. Assuming that I buy an older model of synthesizer, where could I find a complete list of all models with this compatibility? Also, would it be possible to then save a file from the older model, such as a Motif ES, like an All Voice file, and then open that file in my XF and load from there? Compatible synths are Motif classic, Motif ES, S90ES, Motif Rack, Motif Rack ES and tone generators from MU serie (MU128, MU1000, MU2000/2000EX). I still have Motif ES and three plugin boards, all with different type of synthesis. PLG150-VL is so called virtual acoustic or self-oscillating that uses mathematical formulas to emulate sound path from reed through tube to the output (example of woodwind instruments). PLG150-AN is analog representative of digital emulation of analog circuits (VCOs, LFOs, etc.) known from analog synth era. The latest one that I have is PLG150-DX, a 100% compatible with famous FM synth DX7 and compatibles. So, all of them are completely different way of sound generation comparing to sampling founded in Yamaha AWM2 synths like Motif XF. And answer is now. You could not save sounds on PLG boards and load them to XF in the same manner as you do with sampled voices. The only way is to either sample voices that you like, but in most cases it could be very difficult in order to produce same voice. 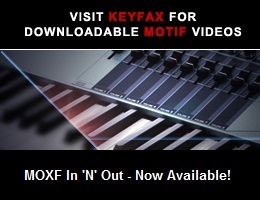 Or to use other synth that has plug-in synthesis capability and to connect its audio output to the XF input. In that case you could use new VCM effects found on XF to improve overall sound quality of PLGs. One note more. I have also bought recently older MU2000EX tone generator from Japan. Yamaha sold these units only in Japan from 1999 till 2004 and it could be occupied with max three plug in boards, like Motif ES. My main reason was to keep these rear boards that I like since I’m now selling my ES. I’m very satisfied with this unit and even more impressed than I expected at the first moment. I’m completing a detail review of this unit and have plan to publish it on Motifator.com in next few days. So, keep informed if you are interested in plug-in synthesis. Thank you! What about the S80/S30 and CS6x? Also, do the MU-Series racks only have XG sounds, the same type as the Clavinova CVP-Series? Yes, I have forgot to mention older synths. Regarding MU, if you want to use PLG150 than the best advice is to find MU2000EX. EX mean Extended Edition and it is 2000 with updated firmware. It should be displayed on device screen during power up. As I found on some forums, firmware update procedure is very complicated and instructions are given only in japanese. So the best way is to check with seller if the update is already done. EX version have some new options, including new Motif like effects as stated on Yamaha.jp website (after translation on Chrome). MU2000EX accept full plugin synthesis that exist on PLG150 boards and voices could be edited in the similar way as it could be done for instance on Motif ES. I even have loaded one PLG150-AN library after conversion from bulk to ANS format using Melas free tool. Voices are loaded in the same way in three user banks and they sounds the same! Regarding installed voices, MU has both standard MIDI and XG voices. Also, it has additional voices due to the sampling capability. I was really impressed with voice quality when I checked installed demos. Of course, there are no mega voices that exist in newer Motifs starting from ES, but bass, guitars and brass sounds very rich. If you consider to buy such device to play and edit plugin board’s voices from PLG150 serie (not older PLG100), than look for MU2000EX not for MU128. On June 2016 I was going to sell my S90ES and I would not loose two PLG150-AN, thus I bought a Motif ES rack to host them. On the one hand I have still to sell S90ES, on the other hand managing PLG on the Motif ES rack is a lot easier because when I power it up there’s no need to load everytime user sys-ex data. I have a Motif ES7 with those two boards, I’m not parting with it because of those boards. What did you mean regarding the need to load user sys-ex data? on the ES7, I have to load the custom AN board voices every time. what’s the difference with the rack version? Due to the fact that the rack version of Motif ES has no USB/SmartMedia slot, Yamaha provided a battery backed memory for PLG boards and their Voices. As a former owner of S90ES I had to face the same annoying issue: reloading bulk data at every startup. Being also a Mac user, since 1988, I’ve always been used to fight against the (Windows)system. Thus AN-Expert Editor running under MacOS9.x with OMS is the only way to go. Anyway, user patches are not needed to be reloaded on any other day, thus if the dump requires resurrecting and old Apple G4, it can be tolerated.